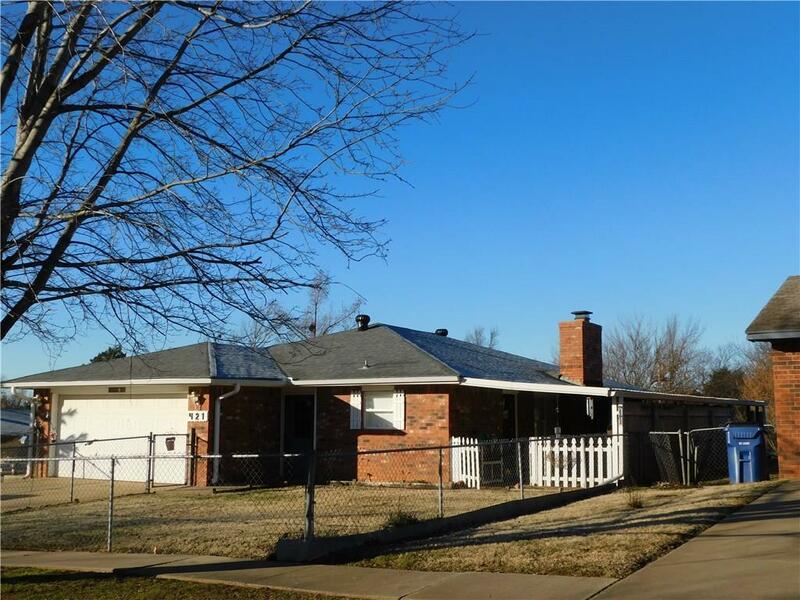 This fully fenced corner property has 3 bedrooms and 2 baths. With brick exterior, 2 car attached garage, and great double sized patio across the north side of the house, this property is not to be missed. This house has a very open feel due to the layout. Bedrooms are a good size w/the master having quite a lot of room. The living area extends to the south offering many possibilities for how you want it to function. Floor coverings are carpet and updated vinyl. The kitchen is roomy, again with a lot of options. There's adequate storage throughout with hall closet, hallway cabinets, & utility storage. The north side covered patios currently are separated & accessed through a gate. The whole yard around the house is fenced! The back and side yard offer great space for children to play. The property also has a storm shelter! This is a MUST SEE. So much opportunity! Check out the pictures & schedule your showing!